This is where Newgate's execution's took place. Description: Between 1783 and 1902, a total of 1,169 people were put to death here or within Newgate Prison/Gaol, 1,120 men and 49 women. 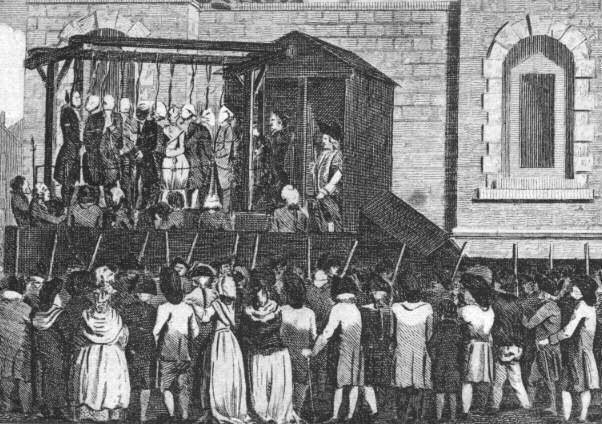 Over 200 felonies were punishable by death in 1800, although in practice people were only executed for about 20 of them. Those convicted of the more minor ones, although sentenced to death, typically had their punishment reduced to transportation. The concept of imprisonment as a punishment only really came in after 1840. Transportation ended around 1888. Public executions were performed here in the lane known as the Old Bailey from the 9th of December 1783 (following the ending of hangings at Tyburn). 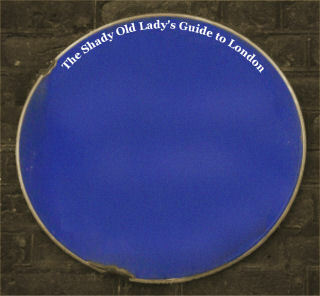 After 1809, almost all hangings took place on the portable gallows in front of the Debtors� Door and continued here up to the 25th of May 1868, when Michael Barrett became the last to hang for the Clerkenwell bomb outrage that killed 7 people. These drew huge crowds, especially if one of the prisoners was notorious. From 1752 to 1809, the bodies of those executed for murder were taken to Surgeon's Hall in the Old Bailey where they were publicly anatomised. The Cato Street conspirators were hung and beheaded here. One famous hanging was that of Thomas Neill Cream who, in December 1892, standing hooded and noosed on the trap said, I am Jack the.... just as the drop fell. In reality, it is extremely unlikely that he was Jack the Ripper. 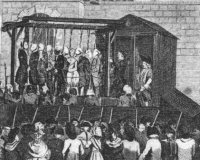 On Tuesday, the 9th of December 1783 9 men and one woman (Francis Warren) were hung side by side on the New Drop at Newgate�s first execution. While George Wolfe became the last person to be executed here on 6th of May 1902 for stabbing his girlfriend to death. The site of the Tyburn Tree, public hanging place for thousands.